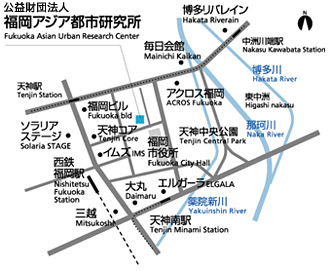 The Fukuoka Asian Urban Research Center is a research institute dedicated to the study of urban policy and to propose urban strategies for the future extending its perspective of research and study further to the Asian region with cooperation and coordination of various quarters of society. The Center is making unprecedented efforts to build a multidirectional network, exchange and disseminate information, and at the same time assume a coordination function for linking together various sectors. Our goal is to be a research institution that lives up to the expectations that “the Center is the right place to go for anything involving Fukuoka and Asia .” Your warm support and cooperation to the Center would be highly appreciated. We must actively commit ourselves to the local community together with citizens, businesses, public administration, universities and NPOs, and must seriously consider what is necessary today for the city of Fukuoka. For this particular purpose, too, we must carry out in-depth studies of various aspects of Fukuoka, and at the same time build a network for collecting multi-faceted information and disseminating information to our partners. Our field of research and study is not limited to Fukuoka or other cities in Kyushu. Our efforts also cover cities in the Asian region. For future city planning, we must consider Fukuoka’s position in the context of Asia, think locally from a global viewpoint, and approach global problems through practices in local communities. In partnership with various cities in the Asian region, we will conduct research and study and make proposals for urban strategies for the 21st century. 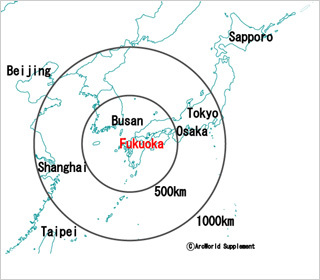 From the two-fold viewpoint of “contributing to urban development of the city of Fukuoka” and “collaboration with and contribution to the Asian region,” the Fukuoka Asian Urban Research Center carries out practical studies and research and makes proposals for the formulation of urban policy. ・Studies of urban policy in the Asian region (studies and research on urban problems and urban strategies in the Asian region).Also, dynamic research and analyses of the social environment and comparative analyses of basic data are carried out in organic collaboration with responsible departments of the Fukuoka city government. The Center is carrying out network building with citizens, NPOs, business people and urban planning consultants who work closely with communities in Fukuoka, Kyushu and Japan, as well as university-affiliated researchers and opinion leaders in Japan and the Asian region. Through this network, the Center conducts exchanges of high-quality information and assumes a coordinating role for linking individual sectors on the network. Competent personnel are essential for regional management. The Center helps nurture people who are capable of identifying their own themes, developing these themes into study plans, further studying these plans through intensive discussions and implementing the finalized programs, by making effective use of the educational and training schemes provided by the Center, including the citizen researcher program, researcher support program for young researchers and short-term researcher program. It is only people who can lay the path for a new age. The Center nurtures the dreams for city planning of citizens, young researchers, business people and staff of the Fukuoka city government, helping bring them to fruition. As an urban research center serving the needs of the city of Fukuoka and the Asian region, the Center feeds back, in a readily understandable way, urban information that capitalizes on the network and achievements of its research into local communities, through journals and the Internet. Further, the Center makes intensive and extensive efforts to collect not only multi-faceted information on Fukuoka and other Japanese cities, but also materials produced in the Asian region, in order to enhance our library. Our library has a broad collection of books on urban policy, reports of various studies and research programs and government documents, including from the Asian region, which are freely accessible to the general public. A dedicated reading room is available for Asia-related books and documents (some 10,000 items, mostly on China and South Korea), newspapers (13 publications) and magazines (approximately 80 titles) as well as documents deposited by the Asian Development Bank (some 1,500 items). Please visit our library. 10 :00 – 17:00Closed on Saturdays, Sundays, national holidays and the New Year’s holiday. Temporary closure for inventory. These services are provided free-of-charge.